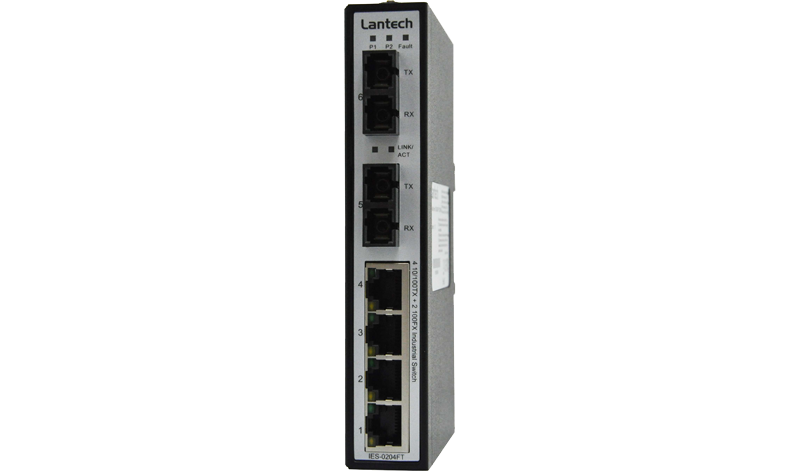 The Lantech IES-0204FT-DNV is a 4-port 10/100TX + 2-port 100FX Industrial Switch for plug-and-play installation. It can auto detect power inputs and supports wide input range from 9V to 56VDC. To increase reliability, the IES-0204FT-DNV provides redundant power supplies. The Lantech IES-0204FT-DNV is designed to meet the demands of industrial environments, comes packaged in a robust IP-30 housing and has been tested extensively to meet Industrial EMI and EMC standards. Rigorous mechanical testing has also been undertaken with free fall, shock, and vibration stability test, which ensure long term reliability in critical industrial environments. It can be used in extreme environments with an operating temperature range from -40°C to 75°C. Featured with relay contact to alarm system, the IES-0204FT-DNV can immediately notify of power failure event. The Lantech IES-0204FT-DNV is compact in size and easy to be installed with DIN rail and wall mount kit. It is the best choice both in inflammable or normal industrial environment such as automation, transportation, heavy Industrial factory, mining, oil & gas, chemical, and processing automation area. The Lantech IES-0204FT-DNV meets with the most critical test criteria in DNV Type test directives consisting of MED (Marine Equipment Directive), EMC (Electromagnetic Compatibility Directive) and LVD (Low Voltage Directive) in which vibration, high voltage, compass safe distance, salt mist tests, humidity etc are conducted to ensure the switch sustaining the harsh on-board environments often founded in Ships, Crafts and Offshore platforms. [Multi-Mode] power budget : Min: 9dB , MAX: 19dB. [Single-Mode] power budget : Min: 19dB , MAX: 26dB.